I’m delighted to be exhibiting at the newly renovated Octagon Hall in the Artist and Designer Fair on Saturday and Sunday 20th and 21st October, 10am til 4.30pm. An elegant and spacious venue, the Octagon Hall has room for upwards of 30 exhibitors. Exhibitions include art, jewellery, furniture, glassware and other designer led products. The renovations on the the Octagon Hall, part of the Pavilion Gardens, were completed earlier this month. It’s a stunning venue situated in 23 acres of award-winning Victorian Gardens where you can take a gentle stroll amongst the autumn leaves and then rest, relax and recruit your energies with something to eat and drink in one of numerous cafes and tea rooms. 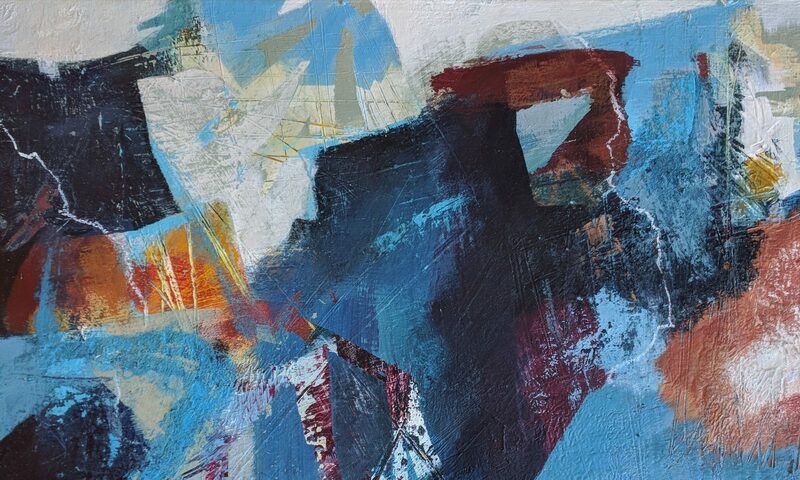 I will have a selection of new work with me completed in the last few weeks, where I have been continuing to explore colour and form in abstraction. My work and inspiration is about the archaeology of place and experience. As the end of October approaches I’m thinking about something for the early Christmas shoppers so I will have a selection of smaller works, prints and my quality boxed notecards available, as these items make unique and individual Christmas presents. The weather forecast is good with sunshine predicted on Saturday, so why not drop in and take a look around. I’d love to chat to you about my work, workshops and coaching. Last night I fell in and out of love. With a painting. Too Early to Fall in Love. What Nick was talking about is the inclination to get attached to parts of our art work in a way that stifles or stops our creativity. If we become overly invested in an idea, an aspect of the work, a corner with some lovely texture, paint marks etc then our creative exploration can be be halted. I notice this in myself. if there is section of a piece I am working that I really like I can get a bit precious and tight not wanting to inadvertently paint over something I love. Then that tightness will often stop me exploring and creating freely. And the work loses energy and can feel unexciting and habitual. The impetus for this post was this painting. I was working on it a couple of evenings ago. It was very early on in the process that the landscape forms began to emerge. Possibly as early as the second pass so in the photograph it hasn’t had a lot of development and there isn’t a lot of history to it. At this point my inclination was to stay with it pretty much as it stood. This may also have been because it’s one of my first large pieces in this new series and with an exhibition coming at Art in the Pen in August I’m keen to keep on moving forward with pieces. A day later as I was working on again and taking a moment sitting in front of it thinking what next? I was noticing a lack of excitement in the painting and found myself thinking “have I fallen in love too early?” I was aware that it felt like there wasn’t anything new in this piece. So I started asking myself the question “Am I willing to risk what’s there and go in another direction not I knowing where the piece will develop. How can I push this further? What would a risky move look like? So, I took a risk, not as big as some but I did take some big moves in a new direction. I took my used paper from my palette and pressed it onto the painting in a few places and I also introduced orange as a complementary colour to the blues which I think has resulted in a new feeling in the work, a new energy and vibrancy. In a long term relationship! I’m much happier with this piece, in fact we are in a long term relationship! There are a few more adjustments I will make to this before final finishing but the essence of the work is there for me now. Is this process something that you recognise? How do you deal with this your own art practice?